Här har vi en VGA balun av Hane modell som gör att man kan skicka VGA signaler upp emot 107 meter genom en enkel Cat 5e nätverkskabel. The VGA Balun II eliminates costly and bulky VGA cable, allowing a VGA source to be connected to a VGA monitor via one (1) 4-pair Cat 5 unshielded twisted pair (UTP) cable. Used in pairs, the VGA Balun II allows VGA video to be transmitted up to 350ft (107m) via Cat 5 at 800 x 600 resolution. 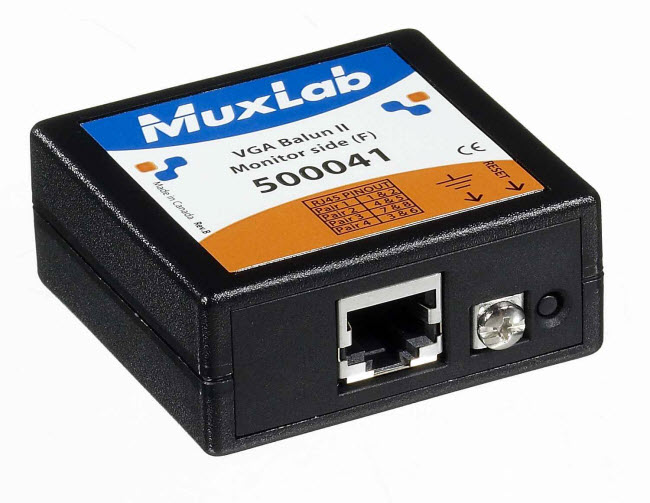 Each VGA connection requires p/n 500040 at the source and either p/n 500041 or 500042 at the display. The product features a "reset" button that may be required when using certain displays. More information may be found in the product Installation Guide. The VGA Balun II works in conjunction with laptops, PCs, plasmas, CRT, LCD monitors and DLP projectors.